With Paso Pizza Kitchen ranch and Dole pineapple tidbits. Baked Sandwiches All sandwiches served with Paso Pizza Kitchen oven-baked potato wedges. Charbroiled chicken breast with your choice of mozzarella, provolone, or cheddar cheese, piled high on top of a French roll. Served with sliced Roma tomatoes, Romaine lettuce, and chipotle aioli sauce. Tomato basil pesto sauce, Roma tomatoes, red onion, sliced pepperoncini, mozzarella, and asiago cheese. Sliced chicken breast, bacon, mozzarella cheese, and ranch dressing oven-baked, and served with lettuce and tomato. Sliced chicken breast, Sliced red onion, mozzarella cheese, and Cattleman's hot and spicy bbq sauce. Oven-baked! Creamy pesto sauce with sliced chicken breast, mozzarella cheese, served with lettuce and tomato, and oven-baked. Sliced chicken, Paso Pizza Kitchen ranch dressing, mozzarella, baked in our oven and served with lettuce and tomato. 1/3 lb. patty on a French roll with your choice of mozzarella, provolone, or cheddar cheese. Served with sliced Roma tomatoes, Iceberg lettuce, Sliced red onion and mayonnaise. Sliced Italian dry salami on a French roll, oven-baked with provolone cheese, and served with shredded lettuce, Roma tomatoes, and Italian dressing. Sliced ham, dry salami, and pepperoni with a generous portion of mozzarella cheese, and topped with lettuce, tomatoes, olives, red onions, and topped with Italian dressing. Our speciality savory meatballs stuffed into a French roll, and topped with marinara sauce and mozzarella cheese. Oven-baked to perfection. Steak sauteed with au jus, mushrooms, bell pepper, red onions, and oven-baked with mozzarella cheese. Oven-baked sliced Italian salami, roasted red peppers, artichoke hearts, diced red onions, and balsamic vinegar glaze then topped with provolone cheese. Made from our fresh rolled dough and stuffed with Paso Pizza Kitchen marinara, mozzarella, and your chioce of any 2 pizza items. Spinach, mushrooms, artichoke hearts, onions, lemon pepper, mozzarella, and asiago cheese with a hint of balsamic vinegar. Freestyle Pizza We proudly serve real 100 percent cheese, the highest quality meats, and the freshest produce available. Pasta All pasta is available for takeout. Served with a slice of garlic bread. Our home-made lasagna is made with ricotta and mozzarella cheese, fresh ground beef, Italian sausage, and linguica. A unique taste. 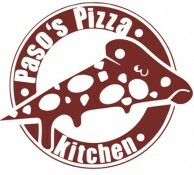 With Paso Pizza Kitchen marinara sauce, oven-baked, and cooked to perfection. Italian sausage and broccoli-stuffed ravioli topped with marinara sauce, and mozzarella cheese, and then oven-baked. Tortellini noodles stuffed with a blend of seven cheeses: Ricotta, Asiago, Fontina, Provolone, Parmesan, Swiss, and Mozzarella. Tortellini with our rich and creamy Alfredo sauce. Our seven cheese tortellini topped with our rich creamy pesto sauce. Linguini noodles topped with our Mission Zinfandel Meat Sauce. Linguini noodles with out right and creamy Asiago Alfredo Sauce, topped with a char-broiled chicken breast. Penne pasta sauteed with minced garlic, olive oil, crushed red pepper flakes, diced Roma tomatoes, and fresh basil. Crisp and delicious! Penne pasta topped with our Mission Zinfandel Meat Sauce. Sauteed in a garlic butter sauce with vegetables. Tender shrimp sauteed ina spicy chili pepper vodka tomato cream sauce. Penne noodles with marinara sauce, tri-colored peppers, diced onion, and Italian sausage, and then oven-baked. Penne pasta sauteed with tri-colored peppers, diced onions, and sliced chicken breast in our spicy chipotle southwestern sauce, and topped with freshly grated cheddar cheese and diced green onions. Spaghetti noodles with olive oil, diced tomatoes, and fresh basil. Spaghetti noodles with marinara sauce, and a generous portion of mozzarella cheese, and then oven-baked to perfection. Spaghetti noodles with Marinara Sauce topped with meatballs and served with a slice of 3 cheese Garlic Bread. Broiled Chicken Breast, Fresh Mushrooms, with Marsala Wine Cream Sauce Poured Over Penne Noodles. Tender Spaghetti Noodles topped off with a generous portion of PPK Marinara Sauce. One specialty pizza of your choice, and one three-topping pizza of your choice. Two Medium Three Topping Pizzas for $26! Gourmet vegetable pizza made with creamy garlic herb sauce. Then we add 4 types of cheese, fresh mushrooms, artichoke hearts, zucchini, Roma tomatoes, tri-colored peppers, red and green onions, and a sprinkle of our special herb seasoning. Our garlic herb and oil sauce topped with mozzarella, provolone cheese, Dole pineapple tidbits, roasted red peppers, and sliced olives. Creamy garlic sauce, a blend of 4 cheeses, sliced mushrooms, Roma tomatoes, pepperoni, topped with Sicilian sausage, and fresh green onions. Our special south of the border sauce topped with mozzarella and cheddar cheese, southwestern seasoned ground beef, fiery hot peppers, olives, Roma tomatoes, onions, and fresh cilantro. Marinara sauce with mozzarella cheese, tri-colored peppers, sliced linguica sausage, sliced chicken breast, diced onions, and sauteed shrimp. Hot, spicy, and delicious. Our rich and creamy pesto sauce topped with mozzarella, provolone, and asiago cheese along with sauteed shrimp and fresh garlic. Fresh made pizza crust brushed with Cattleman Hot BBQ Sauce, with 4 cheeses, chopped cilantro, diced red onion, and oven-roasted sliced chicken. Our creamy Alfredo sauce topped with mozzarella, provolone, and Parmesan cheese with charbroiled seasoned chicken breast. Our creamy Italian white sauce topped with sauteed spinach, mushrooms, sliced chicken breast, and mozzarella cheese. Gourmet crust brushed with creamy pizza sauce, a hint of red chili pepper, topped with 4 cheeses, broccoli, chicken, and lots of chopped garlic. Our creamy Italian sauce topped with 3 cheeses, sliced ham, herb crusted chicken, and real bacon bits. Our own garlic-roasted chicken with our creamy garlic pesto sauce, a blend of 3 cheeses, sliced fresh mushrooms, black olives, and topped with diced green onions. Garlic roasted chicken with our creamy Italian white sauce, a blend of our 4 cheeses, mushrooms, Roma tomatoes, and topped with diced green onions. Our creamy garlic sauce topped with mozzarella, provolone, and Asiago with sliced chicken breast, red onion, bell peppers, and sliced black olives. Sliced roasted chicken and hot peppers make this a fire cracker pizza, sprinkled with cheese, roasted red peppers, sliced green, and roasted peanuts. Our chipotle chili pesto is combined with mozzarella and cheddar, topped with sliced seasoned chicken, tri-colored peppers, and red and green onions. Sliced chicken breast, pineapple tidbits, tri-colored peppers, diced onion, and toasted sesame seeds all on top of our teriyaki sauce, and mozzarella cheese. Meaty pizza made with our own Italian red sauce, a blend of 3 cheeses, pepperoni, salami, Italian sausage, meatballs, and linguica. Our own traditional Italian red sauce topped with a generous topping of mozzarella, provolone, cheddar, meaty pepperoni, salami, sausage, linguica, fresh mushrooms, bell peppers, onions, and black olives. A delicious combination of California pesto sauce, mozzarella and feta cheeses, fresh sauteed spinach, and diced Roma tomatoes. Our traditional red sauce, mozzarella, Roma tomatoes, and topped with fresh basil. Our traditional red sauce topped with 3 cheeses, fresh sliced mushrooms, diced Roma tomatoes, green bell peppers, white onions, and topped with diced green onions. Sliced mushrooms, artichoke hearts, olives, zucchini, onions, diced Roma tomatoes, a generous portion of mozzarella cheese, Paso's Pizza Kitchen Garlic Pesto Sauce, and topped with onions.